The ECG in Figure-1 was obtained from a patient with new chest pain. He was hemodynamically stable at the time this tracing was obtained. How would you interpret the rhythm and, the rest of this ECG? NOTE: In addition to the artifact that is most pronounced in the lateral chest leads — there are 4 Major Findings. Two of these findings are admittedly subtle. How many of these 4 findings can you identify? Figure-1: ECG obtained from a patient with new chest pain. Can you identify the 4 Major Findings on this tracing? NOTE— Enlarge by clicking on the Figure. Interpretation: As always, once we ensure that the patient is hemodynamically stable — We begin our Systematic Approach with assessment of the Rate & Rhythm. Rate & Rhythm —The rhythm in this tracing is complex — so we will defer full interpretation for a few moments. As we will see shortly, it is clinically useful in this case to delay detailed rhythm analysis — because one of the biggest hints for interpreting this rhythm lies in what we find in the rest of the 12-lead ECG! What is obvious about the rhythm — is that the ventricular rhythm is fairly fast — that there is atrial activity — and, that as we step back a bit from the tracing, there is a repetitive pattern = group beating. That is, there are groups of 2 beats and occasionally just 1 beat. That this is not due to chance should be evident because the distance after the 2-beat groups until the next group begins is always the same! (ie, the R-R interval between beats #2-3; between #5-6; between #7-8; 9-10; and 12-13 is the same)! Similarly, the distance after the 1-beat groups until the next group begins is also the same! (ie, the R-R interval between beats #3-4; between #10-11; and between #13-14 is the same)! PEARL: The presence of group beating should always make you consider the possibility of some type of Wenckebach block. Intervals —The PR interval appears to be changing — although it is useful to note that the PR interval is constant and normal at the onset of each of the small groups in this tracing (ie, the PR interval before beats #1, 3, 4, 6, 8, 10, 11, 13 and 14 is normal and equal)! The QRS complex is normal (ie, not more than half a large box in duration) — therefore, this is a supraventricular rhythm. The QT interval does not appear to be prolonged — although the irregular rate makes this challenging to assess. Axis —The frontal plane axis is normal (approximately +75 degrees). Chamber Enlargement — P waves are peaked in each of the inferior leads — but not quite tall enough to qualify for RAA (Right Atrial Abnormality), since P waves are less than half a large box tall. There is a fairly deep negative component to the P wave in lead V1 — which qualifies for LAA (Left Atrial Abnormality). Of note — LVH (Left Ventricular Hypertrophy) is probably present! Although neither of the 2 most common voltage criteria for LVH are satisfied in this tracing (ie, deepest S in V1,V2 + taller R in V5,V6 ≥35mm – or – R in aVL ≥12mm) — voltage criteria for LVH are satisfied in lead V6 (R in V6 ≥18-20mm). And although there clearly is much baseline wander + artifact in leads V4-thru-V6 — the ST-T waves in these leads suggests there may be LV “strain”. Recognition of probable LVH in this tracing is the 1st of the 4 major findings that are present. We suspect many observers may overlook this finding. Q-R-S-T Changes —There are small q waves in each of the inferior leads. In addition, leads II, III and aVF clearly show ST elevation (of at least 3-4mm) — which occurs in association with reciprocal ST depressionin lead aVL. In a patient with new chest pain — these limb lead findings are diagnostic of an acute inferior STEMI, which is the 2nd of the 4 major findings on this ECG. Otherwise — transition occurs normally in this tracing (ie, the R wave becomes taller than the S wave is deep between leads V3-to-V4). And although a QS complex is seen in leads V1 and V2 — a small-but-definite initial r wave is seen in lead V3. We therefore doubt this patient has had prior anterior infarction. Instead, we suspect the presence of LVH accounts for the lack of initial r wave in V1, V2. COMMENT: We suspect the “culprit artery” in this case is acute occlusion of the RCA (Right Coronary Artery) — because: i) In ~80-90% of patients — there is a dominant RCA circulation, which means that most acute inferior MIs are due to acute occlusion of the RCA instead of the LCx (Left Circumflex Artery); ii) The amount of ST elevation in lead III is > lead II (the opposite tends to be true with acute LCx occlusion); and iii) There is a significant amount of reciprocal ST depression in lead aVL (this is less likely to be seen with acute LCx occlusion). QUESTION: Most of the time with acute inferior STEMI — there will be ST depression in anterior leads due to associated acute posterior involvement. What might be the reason why there is virtually NO anterior ST depression in leads V1, V2 or V3 of Figure-1? ANSWER:The KEY point to remember is that the ECG reflects the “balance” of competing forces occurring throughout the heart. As emphasized above — there is probable LVH + “strain”, based on the appearance of the QRS complex and ST-T wave in leads V5 and V6. In patients with marked LVH + “strain” — the anterior leads often show the opposite (mirror-image) picture of ST-T wave changes as are seen in lateral chest leads. We illustrate this in Figure-2 — taken from our ECG Blog #73 on ECG criteria for LVH. Return to the ECG in Figure-1. It is rare to see nearly flat ST-T waves in the anterior leads of a patient with as much inferior ST elevation as occurs in Figure-1. As the 3rd major finding in this case — we suspect there is associated acute posterior MI in this case. Given the presence of LV “strain” in V5, V6 — the baseline tracing of this patient most probably manifested prominent upright ST-T waves in the anterior leads (similar to those seen in leads V2 and V3 in Figure-2). As a result, with acute occlusion of the RCA — there was acute infero-postero STEMI that probably produced anterior ST depression, which we suspect was attenuated by the prominent upright ST-T waves that are so commonly seen in anterior leads of patients with LVH. Figure-2: Illustrative precordial leads obtained from a patient with longstanding hypertension. QRS amplitude is markedly increased — easily satisfying voltage criteria for LVH. In addition, lateral chest leads (especially V5 and V6) demonstrate ST-T wave changes suggestive of LV “strain”. Note how the oppositepicture is seen in anterior leads V2 and V3, which instead of ST depression demonstrate prominent upright ST-T waves (See text). Returning to the RHYTHM in this Case: We have just diagnosed acute inferior STEMI (most probably with associated acute posterior involvement) — that is probably the result of acute RCA occlusion. PEARL: Whenever you see group beating in a patient with acute inferior STEMI — the chances are excellent that 2nd-Degree AV Block, Mobitz Type I (= AV Wenckebach) is the cause of the group beating! 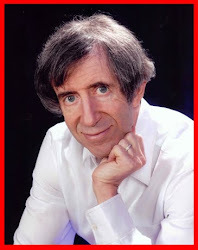 Awareness of this clinical reality greatly facilitates a more careful analysis of the rhythm. Beyond-the-Core: It is especially likely that the cause of group beating with acute inferior MI is AV Wenckebach when noneof the R-R intervals are longer than twice the shortest R-R interval on the tracing! For clarity — we outline groups of beats in the long lead II Rhythm Strip. Dotted BLACK rectangles highlight groups of 2 beats — and dotted RED rectangles highlight groups of 1 beat (Panel A in Figure-3). As noted earlier — we KNOW this represents true “group beating” — because all 2-beat groups are similar to each other, and all 1-beat groups similar. PEARL: The simple step of using calipers and labeling P waves is always amazingly helpful to me in facilitating my recognition of complex arrhythmias. To determine IF the underlying atrial rhythm is regular — I start with an R-R interval within which I can see 2 P waves. This tells me what the P-P interval will be (ie, the distance between the first 2 RED arrows in Panel B of Figure 3). Set your calipers precisely to this distance — and see if you can walk out regular atrial activity throughout the tracing. RED arrows in Figure-3 show that we can! We have already noted that the PR interval is constant and normal at the onset of each of the small groups in this tracing (ie, the PR interval before beats #1, 3, 4, 6, 8, 10, 11, 13 and 14 is normal and equal). This tells us that there IS conduction! IF we now focus our attention within the groups of 2 beats (ie, within the dotted BLACK rectangles) — it should be apparent that the PR interval increases until a beat is dropped. For example — the PR interval preceding beat #5 is longer than the PR interval preceding beat #4 — and then the next P wave (which occurs within, and which peaks the T wave of beat #5) is nonconducted. The cycle then begins again with shortening of the PR interval that precedes beat #6. 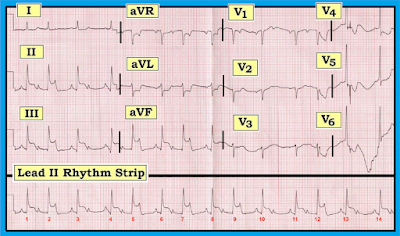 The rhythm is therefore 2nd-Degree AV Block, Mobitz Type I (= AV Wenckebach), with alternating 3:2 and 2:1 AV conduction. We determine these conduction ratios on the basis that for groups within the BLACK rectangles — there are 3 P waves, but only 2 of them are conducting (ie, 3:2 AV conduction). And, within the RED rectangles — there are 2 P waves, but only 1 of them conducts (ie, 2:1 AV conduction). NOTE: The rhythm is the 4th major finding in this case! Figure-3: Labeling of Figure-1 to illustrate the presence of 1-beat and 2-beat groups (Panel A). 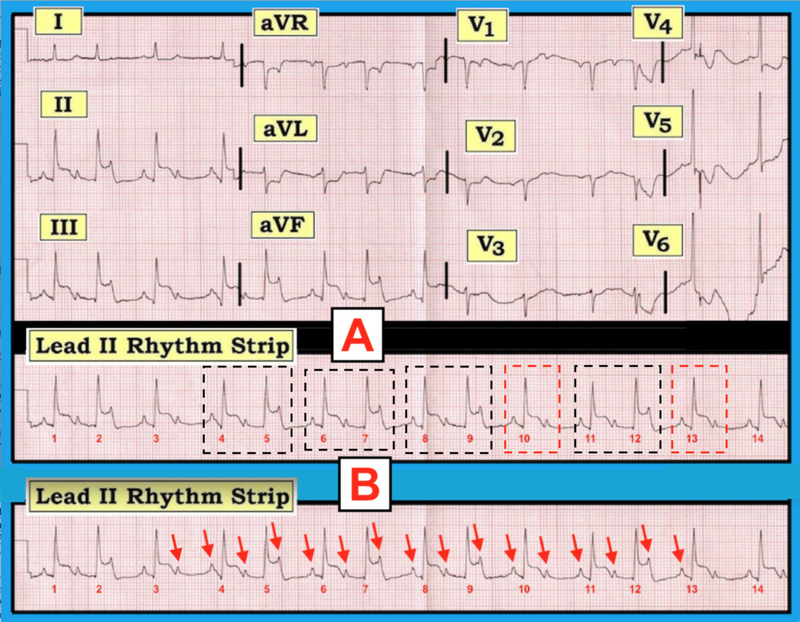 In Panel B — RED arrows illustrate the presence of a regular underlying sinus rhythm (See text). LADDERGRAM Illustration of the Rhythm: We conclude this blog post with a laddergram of the rhythm (Figure-4). While construction of laddergrams can be quite complex when the rhythm is challenging — we emphasize that readinga laddergram that has already been constructed for you is EASY. Vertical RED lines in Figure-4 show the underlying regular atrial rate. Note that each vertical line in the Atrial Tier lies directly under its corresponding P wave in the long lead II rhythm strip. Focus your attention next on the Ventricular Tier. Each line with an arrow corresponds to conduction of a QRS complex through the ventricles. Finally — See how the middle = AV Nodal Tier illustrates the Wenckebach mechanism. Within each of the 2-beat groups (ie, beats #1-2; 4-5; 6-7; 8-9; and 11-12) — the degree of slanting increases. This corresponds to progressive lengthening of the PR interval within a group until a beat is dropped — and then, the PR interval shortens (the amount of slanting decreases) as the next cycle begins. Figure-4: Laddergram illustration of Figure-3 (See text). SUMMARY of this Case: This is indeed a challenging ECG to interpret — with 4 major findings: i) acute inferior STEMI; ii) probable LVH with “strain”; iii) probable associated acute posterior infarction; and iv) 2nd-Degree AV Block, Mobitz Type I ( = AV Wenckebach), with alternating 3:2 and 2:1 AV conduction. The 2 most important findings to appreciate are interpretation of the cardiac rhythm, and recognition of the acute STEMI. Extra Credit to you if you picked up on LVH and the associated posterior infarction. Among the most important “Take-Home” Points of this case are learning how to recognize the phenomenon of group beating — and, realizing that once you see true group beating in the setting of acute inferior STEMI — the most likely etiology of the rhythm will be Mobitz I. With practice — this should literally take no more than a handful of seconds to recognize! You can then verify that Mobitz I is truly the etiology of the rhythm by: i) Using your calipers to verify that regular P waves are present; and, then ii) Focusing your attention within each group of beats to see if the PR interval progressively lengthens until a beat is dropped — before then restarting the next cycle with a shortened PR interval. 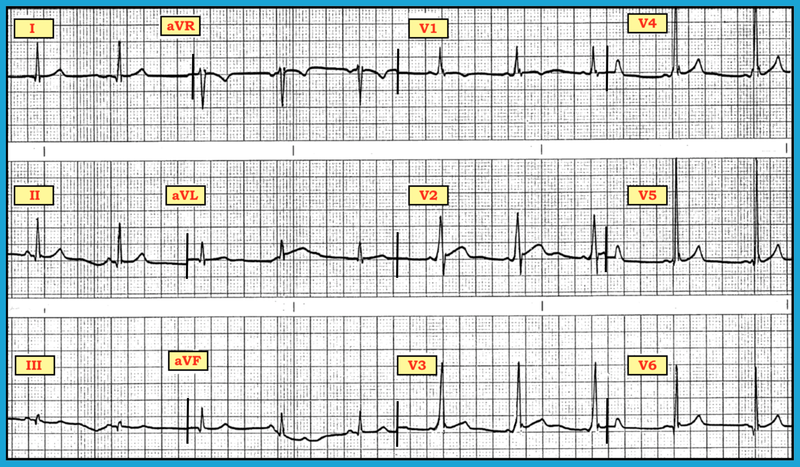 CHALLENGE: Test your newly acquired skill by interpreting the 12-lead ECG and rhythm strip shown in Figure-5. Detailed assessment of this tracing is explained (and illustrated with laddergram) in our ECG Blog #55. Figure-5: 12-lead ECG and long lead II rhythm strip obtained from a 50-year-old woman with chest pain. What is going on? What is the rhythm? 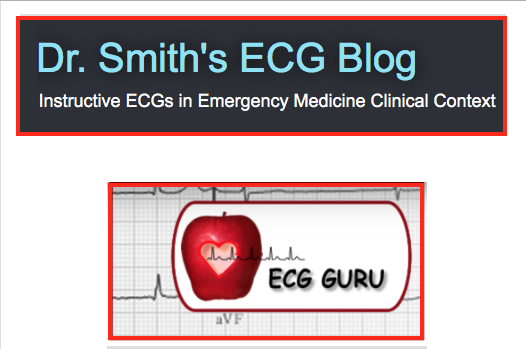 Detailed answers appear in our ECG Blog #55. Acknowledgment: My thanks to Gëzim Berisha from Kosovo-Prishtina, for his permission allowing me to use this tracing and clinical case. 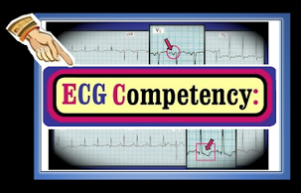 Our 1-hour ECG Video on the Basics of AV Block = EASY LINK = www.avblockecg.com — NOTE: If you click on SHOW MORE (on the YouTube page, under the video) — you’ll see a detailed linked Contents that will facilitate quickly finding whichever part of this video you will to review! 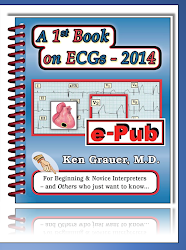 Our suggested Systematic Approach to 12-Lead ECG Interpretation — See ECG Blog #93. 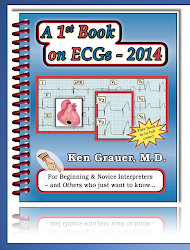 Step-by-Step illustration of How to Draw Laddergrams — See ECG Blog #69. 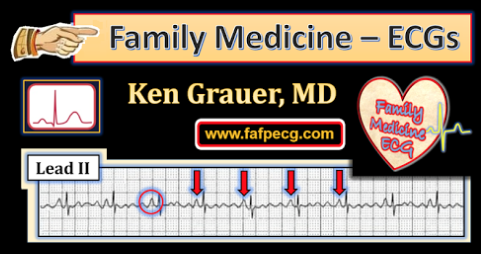 Here are a few cases of Acute MI + AV Block — See ECG Blog #48 and Blog #55. Click HERE — For free Download of our Section 20 (from ACLS-2013-ePub) on AV Block/AV Dissociation. 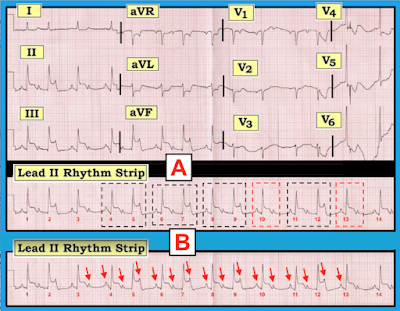 Review of ECG Criteria for Atrial Abnormality (in ECG Blog #75) — and for LVH (in Blog #73). The ECG in Figure-1 was obtained from an otherwise healthy and completely asymptomatic 39-year old man as part of his pre-employment physical exam. How would you interpret this ECG? Is there RVH? Is there LVH? How would you advise this patient? Figure-1: ECG obtained from a healthy and completely asymptomatic 39-year old man. NOTE — Enlarge by clicking on the Figure. Rate & Rhythm — Normal sinus rhythm at a rate of ~60-65/minute. Unfortunately, there is no long-lead rhythm strip at the bottom of this tracing. However, the P wave is upright in lead II with a constant PR interval — and, this defines the rhythm as sinus. Intervals —The PR interval appears to be short (ie, less than 0.12 second in duration). Inspection of the QRS complex in all 12 leads suggests that there may be slight QRS widening (especially in leads V2 and V3). There appears to be slurring of the initial part of the QRS complex in several precordial leads. Chamber Enlargement — N/A (See below). Q-R-S-T Changes — N/A (See below). Clinical IMPRESSION — NSR ( = Normal Sinus Rhythm) with WPW. We emphasize that recognition of WPW in this case is subtle — and would be easy to overlook! COMMENT: This patient manifests the syndrome of WPW (Wolff-Parkinson-White) — in which one or more accessory pathways exist that allow an alternate route for transmission of the electrical impulse from atria to ventricles. Thus, with WPW — sinus impulses bypass the AV node via an AP (Accessory Pathway) — and, therefore arrive early in the ventricles (Panel A in Figure-2). Figure-2: With WPW — impulses bypass the AV node via AP conduction. Although the AP shown in Panel A is right-sided — it could be left-sided, anterior or posterior (and, at times there may be more than a single AP). 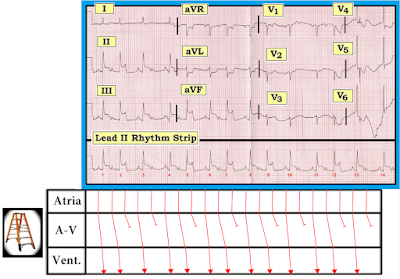 The 3 ECG signs of WPW are seen in Panel B — i) a delta wave (which may be positive or negative); ii) QRS widening; and iii) a short PR interval (See text). Delta Wave: The delta wave is recognized as a distortion of the initial portion of the QRS complex. It is due to the fact that the electrical impulse bypasses the AV node — and arrives at the ventricles directly via conduction over the accessory pathway. KEY Points: Even when conduction is entirely over the AP — delta waves will not always be seen in every lead. Moreover, delta waves may come and go — since conduction over the AP may be intermittent. At times — conduction may simultaneously occur over both the normal and accessory pathway. When this happens — the ECG characteristics of WPW may be subtle, because the contribution from conduction over the normal AV nodal pathway may predominate (and thereby mask) ECG features of preexcitation. 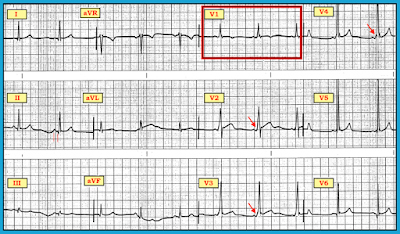 Short PR Interval: The reason the PR interval is short with WPW — is that the AV node is bypassed. With normal conduction in sinus rhythm — the electrical impulse slows down as it passes through the AV node on its way to the ventricles. 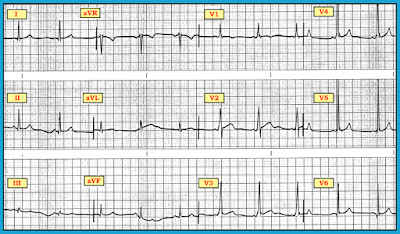 As a result — most of the PR interval normally consists of the time it takes for the impulse to traverse the AV node. The electrical impulse arrives at the ventricles sooner with WPW — because the usual relative delay that occurs when passing through the AV node is avoided by conduction over the AP. QRS Widening: The QRS widens with WPW — because after the impulse arrives at the ventricles (via conduction over the AP) — it must travel over nonspecialized myocardial tissue until such time that it attains whatever distal portion of the conduction system that has not yet depolarized. Thus the delta wave may extend for 0.04 second or more (reflecting slow conduction over nonspecialized myocardial tissue). 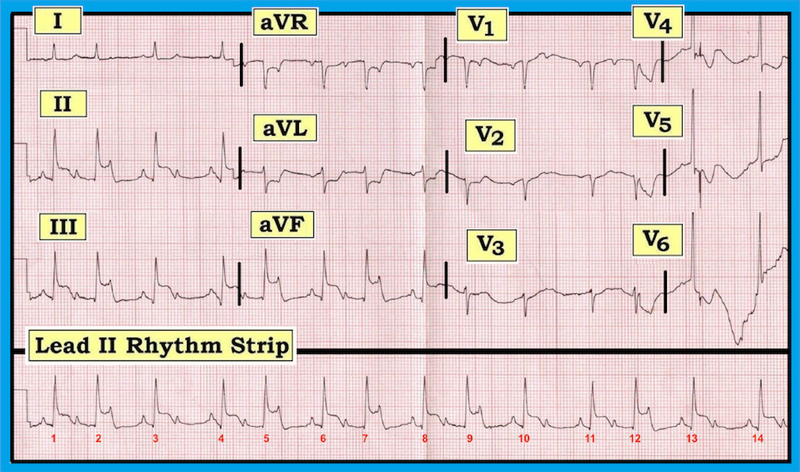 When the delta wave deflection is added to the rest of the QRS complex — the result is a widened complex. WPW is not common in the general population. Its estimated incidence is ~2 per 1,000 subjects. This is just often enough that virtually every health care provider who deals with ECGs will at least occasionally encounter this syndrome. When a patient with WPW is conducting over their accessory pathway — you can diagnose WPW by recognition of the following 3 ECG features in at least several of the leads in a 12-lead ECG: i) QRS widening; ii) a delta wave; and iii) a short PR interval. A problem with diagnosis is that preexcitation (ie, WPW conduction over an AP) can be intermittent. Thus, there may be no indication on a given ECG that a patient has WPW if conduction is entirely (or almost entirely) over the normal AV nodal pathway at the time the tracing is recorded. NOTE about This Case: It is because of less-than-complete preexcitation that diagnosis of WPW is so challenging in Figure-1. Other than a slightly shortened PR interval — not much looks abnormal in the limb leads. Definite delta waves are only seen in leads V1, V2, V3 and V4. Reason #1: WPW is often associated with cardiac arrhythmias — due in large part to availability of an accessory pathway (AP) that facilitates reentry tachycardias and exceedingly rapid conduction with atrial fibrillation or atrial flutter. Fortunately, the vast majority of patients with WPW have an excellent long-term prognosis — and, the overall incidence of sudden death with this syndrome is extremely low. That said, WPW-related arrhythmias can be potentially life-threatening — because extremely rapid rates (over 250/minute) may be attained if a patient with WPW develops AFib or AFlutter. These excessively rapid rates can precipitate deterioration of the rhythm to VFib. Reason #2: WPW is often thought of as the “Great Mimic” of other conditions. The presence of QRS widening with resultant secondary repolarization changes in the ST-T wave may produce an ECG picture that simulates RBBB, LBBB, IVCD, LVH, RVH, and/or myocardial infarction or ischemia. 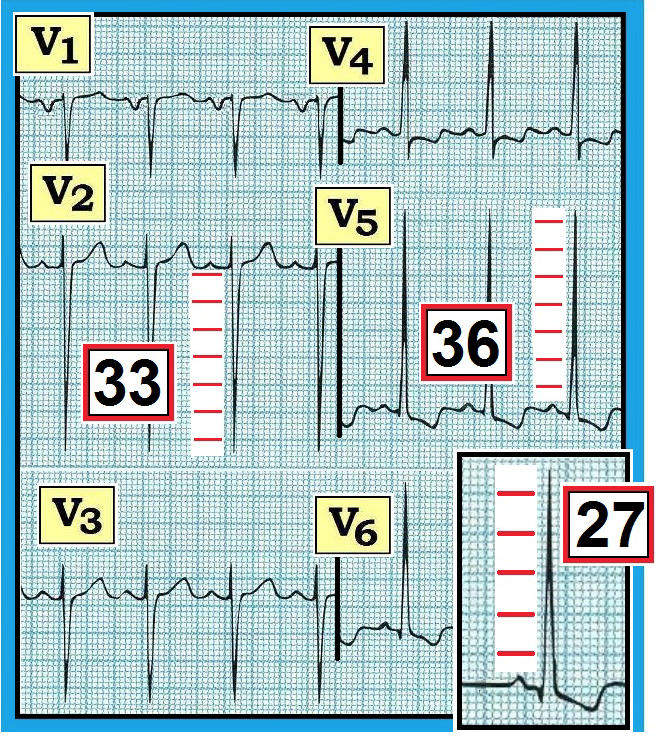 NOTE about This Case: The upright and slightly widened QRS complex in lead V1 of Figure-1 simulates RBBB and RVH. The markedly increased QRS amplitude present in lead V5 simulates LVH. That said, none of these conditions can be diagnosed on ECG — because this patient has WPW! Thus, we have no idea from this ECG if ventricular enlargement or bundle branch block is also present in this case. The PR interval in lead II is short (less than 0.12 second). While normal subjects sometimes manifest slight PR interval shortening — recognition that the PR interval is short should alert you to initiate a diligent search for subtle delta waves (RED arrows in Figure-3). 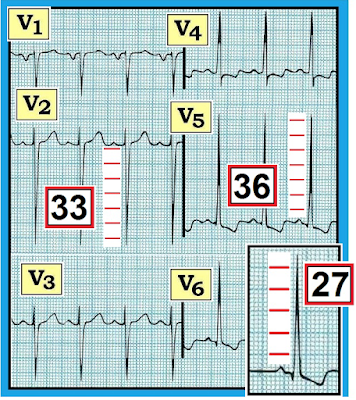 Several of the chest leads in Figure-3 suggest that the QRS complex is at least slightly widened. Remember: Determination of interval duration is assessed from whichever of the 12 leads show the longest interval — and, the QRS complex in lead V3 looks to be more than half a large box in duration. Assessment of Q-R-S-T Changes: Note that transition in the chest leads occurs early — because the QRS complex is already all positivein lead V1 (within the RED rectangle)! Recognition of a Tall R Wave in Lead V1 should prompt immediate consideration of the Common Causes of this ECG Finding. WPW is one of these causes! 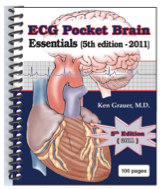 (Please see ECG Blog #81). 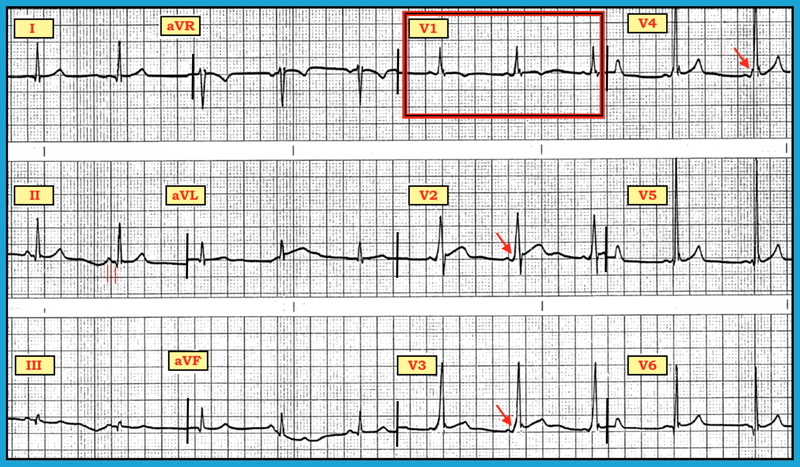 Figure-3: ECG features suggesting WPW in this case (See text). How Would You Advise this Patient? It is important to remember that the 39-year old man in this case has been healthy — and that he is completely asymptomatic. IF this patient had a prior history of symptoms suggestive of cardiac arrhythmia episodes — referral to an EP cardiologist would clearly be indicated. But he is asymptomatic! Clinically — It is worthwhile to go back and question this patient again as to whether he has ever experienced symptoms possibly related to a cardiac arrhythmia. If done in an open-ended manner — a significant number of patients will then remember symptomatic episodes. Questioning might go like this: “Have you had episodes lasting 15 or more minutes, in which you felt dizzy, or felt strong a pounding in your chest?” Be sure to specifically inquire about syncopal (or presyncopal) episodes during exercise. A positive response to any of these questions merits further evaluation. In 2018 — elective referral for RFCA (Radio-Frequency Catheter Ablation) has become a standard procedure with a high success rate for potential “cure” of WPW-related arrhythmias. At established centers with experienced EP cardiologists — effective catheter ablation of the AP is generally achieved in >95-98% of cases, with complication rates of under 5%. Most complications are temporary, but complete AV block may occasionally occur. Thus, although EP testing and ablative procedures have become increasingly safe — they are not completely benign. Balanced by the overall favorable prognosis of most patients with WPW — risk stratification and patient preference enter prominently into the decision-making process. Risk of developing symptomatic arrhythmias in patients with WPW varies with age. In many patients, the capacity for ventricular preexcitation is lost over time. Thus, the risk of developing malignant arrhythmias is significantly less for asymptomatic patients with WPW who are over 35-40 years of age, compared to the risk in younger adults and children. In 2018 — detection of WPW on the ECG of an asymptomatic infant or child merits referral to a pediatric cardiologist. Another group that merits referral includes teenage and young adult competitive athletes. Risk stratification of these individuals can then assist in determining who among them will best be served by more invasive EP testing. In contrast, older adults who have remained asymptomatic from their WPW over the balance of their lives are at significantly lower risk — and do not necessarily need referral. Once again, patient preference and non-invasive risk stratification can facilitate decision-making. The simplest form of risk stratification in patients with WPW is to determine IF preexcitation is lost on Holter monitoring or stress testing when there is physiologic increase in heart rate. Formal stress testing may be especially helpful. Because subtle preexcitation may be masked during exercise — only abrupt and complete loss of preexcitation during exercise reliably corresponds to a long APERP (accessory pathway effective refractory period), with resultant reduced risk of sudden death from deterioration of very rapid AFib. For those WPW patients who have already developed one or more episodes of rapid AFib — the SPERRI (Shortest Pre-Excited R-RInterval) is a non-invasive indicator that provides excellent insight into anterograde conduction properties of the AP. Risk of developing VFib during AFib with WPW is greatly increased when a SPERRI of ≤220-250 msec is seen. Returning to This Case: The patient in this case is a healthy 39-year old man who as far as we know — has been entirely asymptomatic! Assuming further questioning of this patient does not suggest a history of episodes potentially consistent with a cardiac arrhythmia — and, assuming the job this patient is about to be starting does not entrust him with the care of others (ie, flying a plane; driving a school bus) — the incidental finding of WPW on ECG should not disqualify him from work. We need to remember that the only reason an ECG was done — is that it was requested as part of this asymptomatic patient’s pre-employment physical exam. The patient should be told that he has WPW. It may be helpful to give him a reduced-size copy of his ECG, so that he can carry this in his wallet should questions ever arise in the future from a visit to a medical facility. One might consider non-invasive risk assessment with exercise testing — to see if there is abrupt and complete disappearance of preexcitation with physiologic increase in heart rate. If so, this would portend a favorable prognosis — and add further support to a decision not to pursue additional evaluation unless symptoms develop in the future. Finally — the patient should be cautioned that if ever he does develop symptoms potentially related to a cardiac arrhythmia — that he should promptly seek medical assistance. In this case — further evaluation with EP testing would clearly be indicated. Review of Common Causes of a Tall R Wave in Lead V1 — See ECG Blog #81. Predicting AP Location from the ECG — See ECG Blog #76. 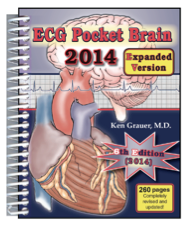 Other Posts regarding WPW — See ECG Blog #18, Blog #37, Blog #87, Blog #121. Cohen MI et al: PACES/HRS Expert Consensus Statement: Management of the Asymptomatic Young Patient with WPW. Heart Rhythm 9:1006-1024, 2012. Liu A, Pusalkar P: Asymptomatic WPW: Incidental ECG Diagnosis & Review of Literature. BMJ Case Reports 2011 (doi:10.1136/bcr.05.2011.4192). Pappone C, et al: WPW Syndrome in the Era of Catheter Ablation. Circulation 130:811-819, 2014. Assaf S, Libby C: Asymptomatic WPW. JETem 2(3):V16-18, 2017. Bunch TJ, Harmon T: Is It Time to Rethink Our Approach to Asymptomatic WPW? Expert Analysis. ACC On-Line. This ECG Blog has generated numerous excellent comments on the EKG Club (by Alexander Nossikoff, Mario Parrinello, Paul Matera and others) — regarding distinction between “WPW” vs WPW "Syndrome”. Technically — saying that a patient has “WPW” implies the presence of an ECG pattern indicative of preexcitation (ie, presence of delta waves, short PR interval, wide QRS). For this “WPW pattern” to then qualify as WPW “Syndrome” — there must also be the presence of cardiac arrhythmias due to preexcitation. 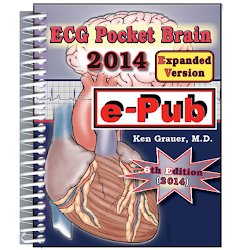 The field of EP cardiology has dramatically advanced in recent years. EP testing followed by ablation of one or more accessory pathways offers potential for “cure” from WPW-related arrhythmias. But determining which patients are to be referred to EP Cardiology does not (and should not) uniquely depend on whether the “Syndrome” of WPW has yet declared itself. My impressions of the literature are that in 2018 — asymptomatic children with WPW (even when they have not yet demonstrated WPW-related cardiac arrhythmias) should still be referred to a pediatric cardiologist. At the least, there should be noninvasive evaluation by an expert in this area in an attempt to gage probable degree of risk for developing serious (potentially life-threatening) arrhythmias. I believe the same recommendation should apply for teenagers and young adults participating in competitive sports — at least in the United States in those areas of the country where a screening ECG is part of a pre-participation sports evaluation. And, once you detect a WPW pattern on the ECG on an asymptomatic young athlete — it becomes hard not to refer that individual to a cardiologist. NOTE #1: Is there any “defense” if you as a noncardiolgist find WPW in a young asymptomatic athlete but do nothing — and this athlete then develops a lethal episode of very rapid atrial fibrillation that leads to cardiac arrest? NOTE #2: If this young adult athlete is felt by an arrhythmia specialist to be of “lower risk”, with non-invasive stress testing demonstrating complete and abrupt resolution of preexcitation with physiologic increase in heart rate — nothing more might need be done other than long-term follow-up. But the point is, that despite not having WPW “Syndrome” — this is clearly a person who should be evaluated by a provider with expertise in cardiac arrhythmias. In contrast — Consider the case of a 60-year old man or woman with WPW on ECG, and a history of rare episodes of reentry SVT that are easily controlled with intermittent use of AV blocking agents. By definition — this patient has WPW “Syndrome” — yet given the patient’s age, the nature of their arrhythmia and the ease of control with no more than intermittent medication — referral to EP Cardiology for an ablative procedure is clearly not mandatory. In fact, patient preference in this case is probably the most important factor in long-term decision-making. Clearly, management decisions in such a theoretical patient might quickly change (ie, if this patient developed atrial fibrillation with a very rapid response) — but the point is, that is that despite having WPW “Syndrome” — optimal management decision-making will depend more on other factors. BOTTOM LINE: In my opinion — whether I describe the patient in front of me with WPW on his/her ECG as having (or not having) WPW “Syndrome” is not the determining factor in how I manage this patient. As for the asymptomatic 39-year old man in this case — individualization of each patient is essential. Depending on factors I outine above (under How Would You Advise this Patient?) — referral to an arrhythmia specialist may or may not be needed in this case (and may or may not be desired). P.S.— I fully realize and acknowledge that others may disagree with my opinions. That’s fine. We ALL learn from healthy academic discussion! Your comments are welcome!